Show them what you love: FOUR. Toast with Butter and Cheddar and Mozzarella cheese! FOUR. 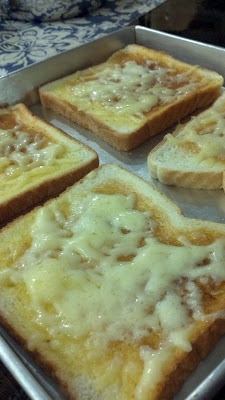 Toast with Butter and Cheddar and Mozzarella cheese! It's simple and fast to get it done! Toast the bread and spread the butter evenly. Then, sprinkle some cheddar cheese and mozzarella cheese! Sprinkle as much as you want! The more, the delicious it will be! Microwave it for 15 to 20 seconds! Drink tea while you munch on it!